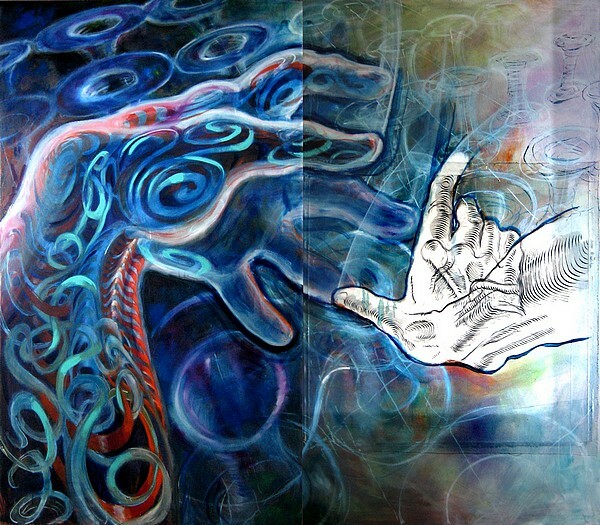 I paint two hands over what I call "vortex", Is a term I take of my readings of Nuclear Physics that I really like it. ;. . before six jahren I meditated. There a voice came from the back and asked me where I wanted to be then, in white kasten there or in mine makrouniversum which appeared to me in meditation as atomkern. I said to that is right, " I want to sit in yours hand ". There she said is right to me, " you do not sit in mine hand, you sit in mine hug ". best greetings by H.RASPler. verry nice beautiful, on a Still my favourite of your works best greetings Hans RASPler.